Winter is upon us! Weather conditions can affect your driving and how your vehicle runs on a daily basis. Prepare your car for winter conditions to keep your family safe and your car in good condition! Get your car in for a tuneup before you start driving in winter conditions. The holiday season can be very busy and hectic as you prepare for family visits and holiday celebrations. Fit in a tune-up for your car before the winter hits so you can identify any issues with your car before you start driving with conditions like snow, ice, and extreme cold. Your car could have some minor issues that did not bother you in the summer and fall, but these minor issues can be exacerbated by the extreme cold and snow in Reno and Sparks! Take your car to some technicians who can identify anything that needs to be addressed to keep you safe out on the road. Your brakes are one of the most important features on your car, especially in the winter months. Make sure your brakes are in tip top shape before you start driving in snowy or icy conditions. Get your brakes inspected as soon as possible to reduce the chance for any problems with your brakes during the winter, especially if your brakes are making funny sounds! If you live in an area that gets very cold and snowy like Reno and Sparks, you can switch to a “winter weight” oil. Oil for the winter is lighter in order to prevent the oil from turning into sludge in the cold and clogging up your vehicle. Oil for the summer is thicker, since the heat will cause oil to get thinner. Take your car to professionals who can make sure your oil is ready for winter. Make sure your tires can drive through the snow! There are different types of tires for various weather and driving conditions. You don’t need the same tires for driving on a highway as you would for off-roading. In the same way, your tires for summer driving may not be the best for driving through snow or on ice. 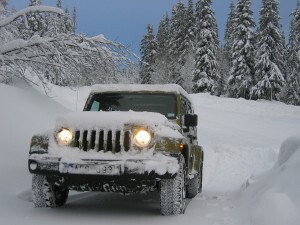 Get yourself some snow tires or chains so you can be safe driving through the snow! Keep a checklist handy of all of these winter tips and more so you are ready for whatever winter brings. An important item on your checklist for preparing your car for the winter is the battery. Cold temperatures can take a toll on your car’s battery, so you need to have a few things prepared in order to take care of your car’s battery in the winter time. In Reno and Sparks, your windshield wipers can go from not being used for months to working overtime in the winter! If your windshield wipers are not effective, it can cause you major problems when driving in the snow or rain. You know it is time to change your windshield wipers if they are not clearing your whole windshield or if they leave streaks when you use them. From all of us at Liberty Collision, drive safe this winter!